Yields up to 13,000 pages. Delivers consistent printing performance, quality, and affordability. Count on professional-quality color documents for an exceptional value. Get an ultra-low cost per page1 and the results you expect every time with Original HP PageWide extra-high-yield cartridges, precisely tuned to HP printers and MFPs. Easily replace cartridges in a snap, and tackle high-volume print jobs without interruptions. Finish print jobs—even when a cartridge is running low—and don’t get stuck with a half-printed page. Help ensure you’re getting the authentic HP quality you expect with innovative anti-fraud technology. Original HP PageWide cartridges are designed to work consistently page after page. 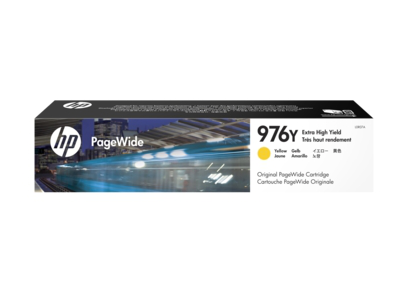 1 Yield based on ISO 24711 cartridge yields for HP 976Y Extra High Yield Original PageWide Cartridges. Comparison based on ISO 24711 cartridge yields for HP 976Y Extra High Yield Original PageWide Cartridges compared with HP 970 series Original PageWide cartridges. Extra-high-yield cartridges are compatible only with HP PageWide Pro 500 series MFPs and printers. Learn more at http://www.hp.com/go/learnaboutsupplies. 2 HP Planet Partners program availability varies. For more information, visit http://www.hp.com/recycle. 3 Water, smear, and fade resistance based on ISO 11798 testing. For details, see http://www.hp.com/go/printpermanence. 4 Tested in HP PageWide Pro 577dw Multifunction Printer. Average continuous composite cyan/magenta/yellow yield based on ISO/IEC 24711 or HP testing methodology and continuous printing. Actual yield varies considerably based on content of printed pages and other factors. For details, see http://www.hp.com/go/learnaboutsupplies.